You are invited to a very special wedding. This gorgeous blonde princess is marrying the man of her dreams and she must have a perfect wedding. Let's start by dressing up the bride. Choose the most special dress and accessories. Make her look wonderful and after that take care of the wedding decorations. She will have the perfect day thanks to you! Beautiful princess Cinderella is getting married with her beloved prince. From now on she is going to live a happy life. She will forgot about her stepmother and sisters and she is going to be happy! So, today, is a big day for her. Let s give Cinderella a helping hand on getting dressed for the most important moment of her life! 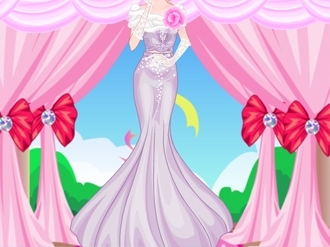 Be her fashion advisor and dress Cinderella up with the perfect bridal outfit! Enjoy! Do you remember the story of beautiful Indian princess Pocahontas and John Smith, the adventure seeker from Great Britain? They fell in love with each other, but John Smith was seriously injured in a battle and had to return to Great Britain and leave Pocahontas... You think this story’s got a sad ending? That’s just because you don’t know what happened next! Half a year had passed, John Smith recovered and returned to the Indian land where beautiful Pocahontas was waiting for him faithfully, not losing hope. The father of Pocahontas decided that John Smith is the best husband the Indian chief’s daughter can dream about and blessed their marriage. And today is the big day! Pocahontas is going to marry the love of her life to spend her days next to him in the beautiful forests and mountains of her homeland. 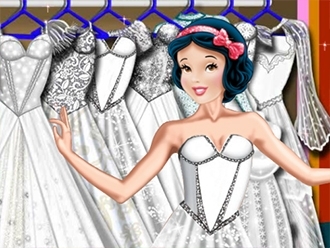 Will you help Princess Pocahontas get ready for the most happy day of her life? What will her wedding gown look like? Will she follow the Indian tradition and wear a dress of natural fabrics decorated with feathers and beads? Or will she follow the European royal fashion and pick a long and glittery princess gown of silk and velvet? 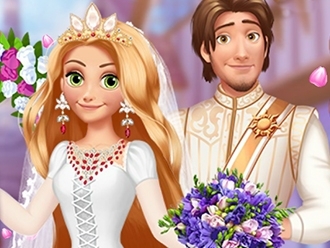 Play Rapunzel Medieval Wedding and organize the biggest day for this princess that takes place in the Middle Ages! The ceremony will take place at the Town Hall, where they used to have them in that time, because everyone would attend the wedding of royalties. Make it look extra pretty for this special day! Put a wooden kart filled with flowers and make a flower arcade at the entrance. Create an amazing mosaic design on the floor in the center of the square. Hang ribbons and bows everywhere and banners with the royal sigil of this couple. Complete with fairy lights and flying lanterns. So romantic! Now you have to dress up the bride and groom. 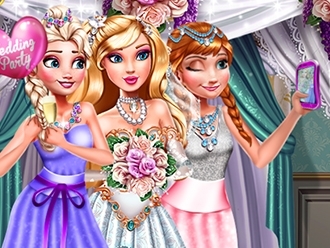 Style Rapunzel's lovely hair and choose for her one of the gorgeous wedding gowns you have available. If you want to stay true to these Medieval times, choose the long sleeves. The flower bouquets back then where colorful and gorgeous and her veil has to be long. Complete with precious jewelry and a tiara. For Flynn you have to pick an elegant suit, a pair of white gloves and a golden crown. 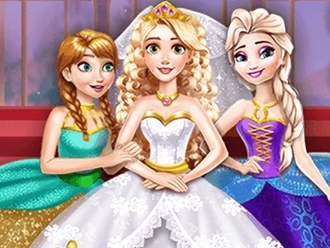 Have a great time playing Rapunzel Medieval Wedding!